Again, Obama will not associate the killer was motivated by Islamic indoctrination. Instead, he tries to convince the American people it was committed by a lone gunman that has no ties to terror organizations. He referred to the attack as terror and hate without associating the killer with Islam. Obama’s speech was anemic in identifying the cause of the terror attack and then hopes that God, not American resolve, will eliminate the threat of terrorism. Americans are beginning to question Obama’s approach to secure the country from Islamic terrorism. They realize that he has not worked with our military commanders to propose a plan that will effectively eliminate the terror organizations. Instead, his speech confirms he will not associate terror attacks as being motivated by Islamic beliefs. Obama has already revealed his propensity to be weak in defeating Islamic terrorism as demonstrated with the Benghazi attack in Libya that took the lives of four Americans. His response to excuse his ineffectiveness was to blame the September 11, 2012 Benghazi terror attack on a YouTube video. As president of all Americans from many different ethnic and religious persuasions why should he state there is no future for those who slander the prophet of Islam? One would expect a Muslim Leader, not the President of the United States, to state a threat to those that slander the prophet of Islam. This announcement by Obama reveals he has a strong affinity for Islam and the Muslim people. Obama’s affinity for the Muslim people and the Islamic religion continues today as he will not associate Muslim terrorism with Islamic ideology. 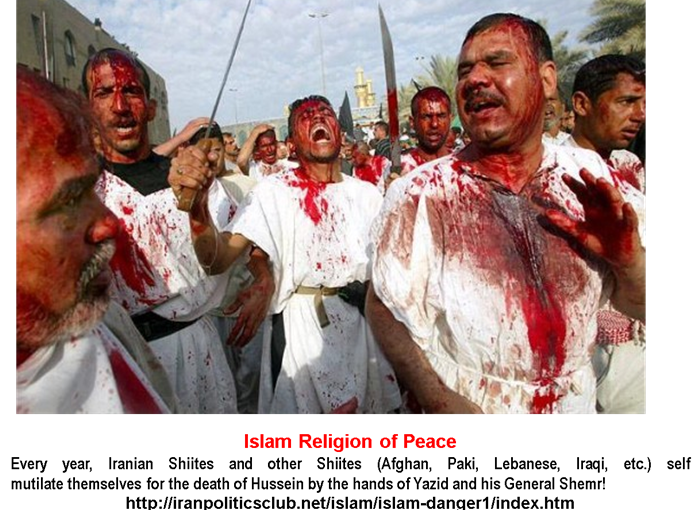 Instead, Obama publically states to the American people that, “Islam is a religion of peace.” The American media will not show the photo that illustrates the Islamic objective is to have Islam dominate the world. The photo was provided via http://iranpoliticsclub.net/islam/islam-ww3/index.htm; the largest website that informs people world-wide of the Islamic threat. The Sad Reality of Today. It is sad to learn that democrats and republicans cannot work together to identify that Islamic ideology is driven by the Qur’an and implemented with Sharia law. Because of party allegiances to President Obama, Islamic ideology is not defined. This inability to define the problem prevents Muslims and Americans to solve the fanatical terrorism problem. It has become evident that many top representatives in government will discard truth and integrity to protect their interests and jobs to fall in line with Obama’s weak response to the Islamic threat both in America and countries around the world. The morality and truthfulness that is needed to keep America strong and be the greatest country on earth has reached a new low. The lack of integrity stems from the poor education provided to our youth whereby respect and honor for the truth is not taught. >>> Obama not identifying the threat as Islamic in such instances as the Fort Hood and the Orlando massacre terror attacks? >>> The fabricated YouTube lies by Barack Obama with Hillary Clinton? Their lies were fabricated to divert any culpability for the deaths of four Americans in Benghazi, Libya. This is well documented in the novel, Obama, Islam and Benghazi. >>> Obama propaganda to the American people that “Islam is a religion of peace?” This claim is false as clearly documented in the novel Allah, We, Our and Us. >>> Obama’s release of five top Islamic military terrorists from Guantanamo for a U.S. deserter ? >>> The Obama-Iran Nuclear Deal? It allows 150 billion dollars to be injected into Iran’s economy and continued development of a nuclear weapon. Is Iran, a Shiite regime, being supported by a Shiite Muslim?. >>> Obama’s statement two weeks after the Benghazi attack to the United Nations? At this international body, Obama stated that “The future must not belong to those who slander the prophet of Islam.” These are the words expected from a Muslim leader NOT the president of the United States. >>> Obama is an African-American? In reality, Obama is a Muslin-American by birth. His father and brothers are all Shiites. To denounce his Islamic faith, he would be an apostate, which will make him a target for death according to Sharia law. >>> Obama is an American citizen? This is true, but it does not exclude the fact that he is a Shiite Muslim. As a Shiite, it is plausible to see that Obama supported the Shiite terrorist regime of Iran by facilitating the Obama-Iran Nuclear Deal. The American media would not inform the American public of these facts. Integrity and truth based upon facts are no longer the standard of honest and objective reporting by the Liberal Media of today. The above list is but a small sample that confirms Obama compromises the safety of the United States with his affinity for the Muslim people and belief in the Islamic faith; a belief inculcated into his mind with his indoctrination of the Qur’an as a young boy. This fact has not been revealed by the liberal media and government representatives who may be too embarrassed to admit Obama, a Shiite Muslim by birth, was not vetted properly to be president of the U.S.
Will our Government representatives permit the Obama-Clinton Benghazi deception to go unpunished? Will Americans accept Hillary Clinton’s continued run for president even though she deleted classified e-mails placed in an unauthorized server? These violations far exceed the violation of General Petraeus. America may be losing its most beautiful heritage as the land of opportunity for all people because its moral structure and high regard for truth has deteriorated; and it all begins with the president of America. Next Next post: Will Islam Fuel World War III?